Photography, besides being hobby, is quite in fashion these days. With the trend of smart phones and high resolution cameras, photography becomes quite fun. Everyone having an android device loves to take pictures and selfies for sharing on social media like Facebook, twitter, whatsapp, instagram, etc. and for that purpose they want something that can beautify their pictures without much effort. So here I am going to list down the Top 5 Android Photography Apps that every android user and photography lover should have. Camera zoom FX has topped the list with its remarkable photo taking features that has won millions of hearts. Besides lots of photography apps, Camera Zoom FX gives its users customized features of selecting effects of their own choice and add filters. However, if you like the pre-made effects and filters then you can also apply that as well. You can get the app in just $2.99. Camera360 ultimate is on 2nd spot at our list of top 5 photography apps. The app provides 10+ free camera modes for taking exceptional photos and selfies with 200+ exclusive filters. The app deploys professional photo editing tools with free sharing ability on social media. The app has the current rating of 4.5 on Google Play. The app is free to use and it is a must try if you are a photography lover. Camera fun pro is another very popular and amazing photography app that is a little bit different from other apps. The app is skilled to add the fun element in your pictures besides taking professional photographs. The app allows you to check live photo effects before taking pictures so that you can check which effect you want to apply on the pictures before actually taking them. The app has current rating of 4.4 and is immensely popular among people. Cymera is another wonderful photography app with great user ratings and comments. 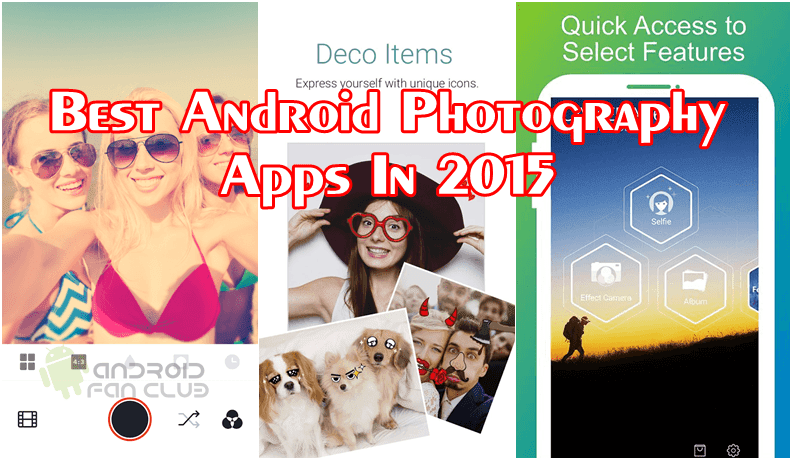 The app succeeds to win number 4 spot of our list of top 5 photography apps for android and thus, a must try. The app gives live filters and lots of camera options for selfies. The app is great in retouching as it detects the face automatically and apply make-up. The app is a complete package that provides strong photo editing tools along with collages and text, decorations, etc. Retrica is afavorite app of millions of people and the app worth it. So I ranked it on number 5. Retrica guarantees to transform your photos into delicious piece. With over hundreds of live filters, you will never run out of options to click photos with unique style. Retrica also adds trendy logos to your photos to make it more attractive. Retrica is a great app with a timer, real-time filters, collages, watermark, blur option, etc. you will have an actual fun. Do try these photography apps and let us know about the experience you get through them. Do mention in comments if some of your favorite apps are missing from the list. Enjoy photography!